Performance Time: Approximately 10 minutes, 9 pgs. SPOOF. In “A Case of Indigestion,” a private investigator on the hunt for a femme fatale’s missing boyfriend ends up with two corpses, no dinner, and a stinky fish. 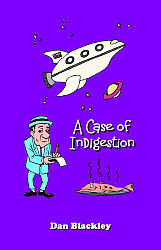 Included in the short play collection "A Case of Indigestion." Dan Blackley is an award-winning playwright and director of educational and community theatre. He received his MA in Theatre Arts from California State University, Los Angeles. Mr. Blackley has been a Theatre Arts instructor for the past 25 years. He lives in Orange County, California.